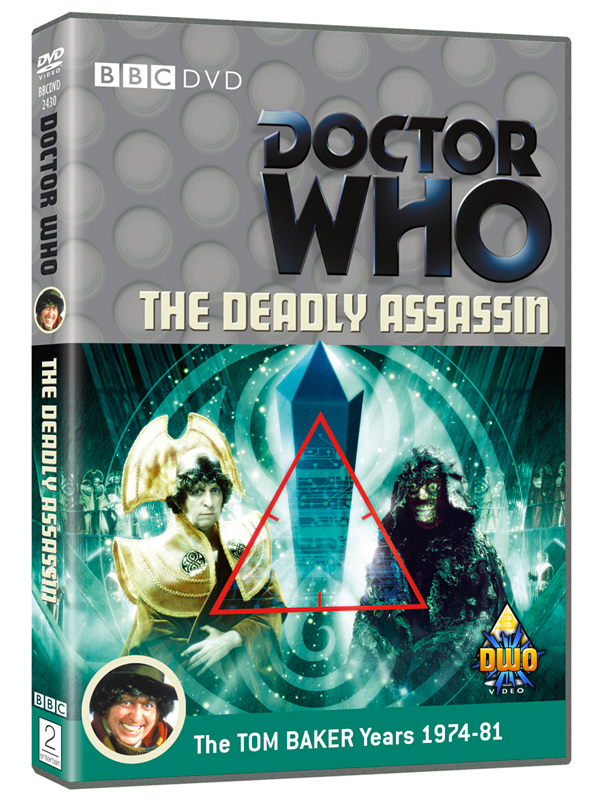 Doctor Who Online have today revealed the cover for The Deadly Assassin. Click here to see a larger version. I like the basic composition of this and the colouring is good (although the Doctor’s collar perhaps stands out a little too much). Not keen on the Eye of Harmony, though, and the graphics are a bit over the top with both the Prydonian seal and the gun sights. Which given they’re not sighting on anyone seem particularly redundant. I think it would be better without the red triangle and the Eye shifted down a bit – it doesn’t really need to break out of the frame (as it barely does anway). On this image the levels around the Master’s face don’t seem to match those of his cloak, but I’d have to see the printed version to be sure. Annoyingly, I’m almost certain to use that shot of the Doctor on my cover – well, you have to, don’t you?